Being inconsistent is the definition of being mediocre. Have you heard this definition of mediocrity? This makes sense! If I’m good at something once in a while but not all the time – that averages out to mediocre. This is important to understand because, if someone tells me I’m good at something, I’m actually only going to be good at it if I’m consistently good. If I’m good and then not good and then good again and then poor, I’m inconsistent. And I’m mediocre. This applies to my relationship with God as well. One of my goals is to have a very good relationship with God. In order to do that, I have to be consistently good in my walk with him. I am reminded of this every time I read about people in the Bible who get all excited about God because he did a miracle and then – in the next paragraph – they are back to their old ways. The excitement and the emotion are suddenly over – and so is the interest. But there is no evidence that any one in Babylon actually listened and turned to God. No one. We read many examples in the Bible of people who had this spiritual inconsistency. This mediocre relationship with God. 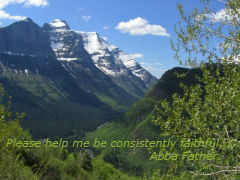 Please guide us in being consistent and faithful in our relationship with you, Abba Father.